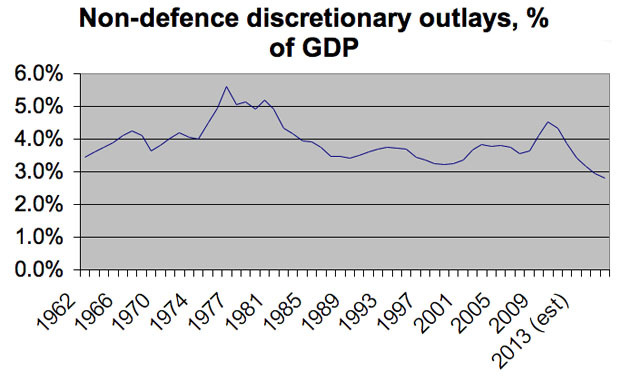 Via one of Ryan Avent’s colleagues, here’s a chart showing the trajectory of non-defense discretionary spending over the past 50 years. This is basically the spending that’s left over after you take out Social Security, Medicare, Medicaid, the Pentagon, and interest on the national debt. This is the part of the budget that Republicans are trying to slash. It’s small, it’s decidedly not a long-term problem, and it’s focused largely on the neediest people in the country. Going after it is a sham, but it’s a sham that the Republican base of old people, rich people, and corporations all support. It’s a disgrace.